Carrying Of Post-Paid Connection (Sim-Card) Is Compulsory. Srinagar is the summer capital of the Indian state of Jammu and Kashmir. The city is famous for its gardens, lakes and houseboats. It is also known for traditional Kashmiri handicrafts and dried fruits. However, the earliest records mention the name as "City of Sun". It is also known as Mughal Gardens of Jammu & Kashmir & Kashmiri Venice/Venice of East. Gulmarg literally means "Meadow of Flowers" is a hill station and popular skiing destination. - Originally called "Gaurimarg" by shepherds. Also, Gaurimarg, named after Devi Parvati, wife of Lord Mahadev/Shiva, finds mention in Shivpuran. Gauri= Parvat & Marg= Meadow, so literally, it means the meadow of Devi Parvati. A temple dedicated to Lord Shiva is still in place at centre of this beautiful meadow. The original name "Gaurimarg" was changed to "Gulmarg" by the Muslim King - Yousuf Shah Chak. Gulmarg means the place of roses. Gaurimarg has been a resort for the kings like Yousuf Shah Chak and Jahangir who used to visit frequently. Now it is the "heartland of winter sports in India. Pahalgam - The Valley of Shepherds was once a humble shepherd's village with breathtaking views. Now it is Kashmir's premier resort, cool even during the height of summer when the maximum temperature does not exceed 25 deg C. It is also associated with the annual Amarnath Yatra. Chandanwari (16 kms from Pahalgam) is the starting point of the yatra that takes place every year.During the month of Sawan, an ice stalagmite forms a natural Shivling in the Amarnath cave. Carrying Of Post-Paid Connection (Sim-Card) Is Compulsory.Any kind of air/rail fares. Any still/video camera fees, entrance fees for monuments and any activities suggested in the itinerary are chargeable direct. Any additional meals/en route meals, sightseeing and activities other than those mentioned in the itinerary. Any services not mentioned under package inclusion will be additional. Pick up from Srinagar Airport in the afternoon. Meet and greet. Transfer to houseboat and check-in. Rest of time at leisure for personal activities. In the evening, Shikara ride on Dal Lake to enjoy sunset. Dinner and night stay in houseboat. After breakfast, check out from the houseboat & leave for Darshan of Shankaracharya Temple. 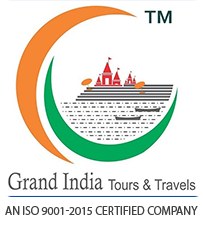 After Darshan, sightseeing of Mughal Gardens, Cheshmashahi, Parimahal, Botanical Garden, Shalimar Gardens, Zararwan Hills by road transport. Then visit of the famous Hazratbal Shrine situated on the bank of Dal Lake. 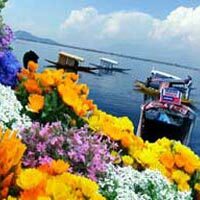 In the evening, free for shopping as well as Shikara Ride around famous Dal Lake & Char-Chinar (Floating Gardens). Check into the hotel at Srinagar. Dinner and night stay. After breakfast leave for Gulmarg-"Meadows of flowers by road transport. A short trek up to Khilanmarg (optional at guest own cost). Drive back to Srinagar. Dinner and overnight stay at hotel. After early breakfast, check out from the hotel & proceed to Pahalgam, on the way sightseeing of Saffron fields & Awantipora ruins. Afternoon return back to Srinagar. Dinner & night stay at Srinagar. After breakfast leave for full day trip to Sonmarg. The Sindh meanders along here and abounds with trout and mahseer, ponies can be hired for the trip upto Thajiwas Glacier a major attraction during summer months. In the evening drive back to Srinagar. Dinner and night stay at hotel. After breakfast in the morning, free for personal activities. Transfer to Srinagar Airport to board the flight in the afternoon. Any kind of air/rail fares. * Above fare is per person.